We've been so busy lately that we've hardly had time for TV, but that doesn't mean we don't still love our favorite network hosts Moose and Zee! After seeing a little short on Nick Jr where they briefly show you how to make Moose and Zee felt pillows, Emmylou convinced me that we needed to tackle the project. One crafternoon later, they were finished. Aren't they cute? We're loving all this rain we've been getting lately! Is there a league for this? Or maybe we should start a fund for her future gambling problem? I don't want to brag or anything, but Emmylou seems to be a claw prodigy. She is obsessed with playing the claw game and actually wins almost every time she plays it. Seriously, she's scary good. Maybe 5 for 7 tries at this point, not including the time she pulled out two prizes at once! The only drawback? What the hell am I supposed to do with all the crap she wins?! Things like a purple dolphin covered in flames and a bright red Betty Boop pillow just don't really fit our decor. Luckily she hasn't gotten too attached to her winnings yet. Like most addicts, the thrill is all in the get. Belated, as usual, but here are some pics from E and M's first days of school. How are they this big already??? 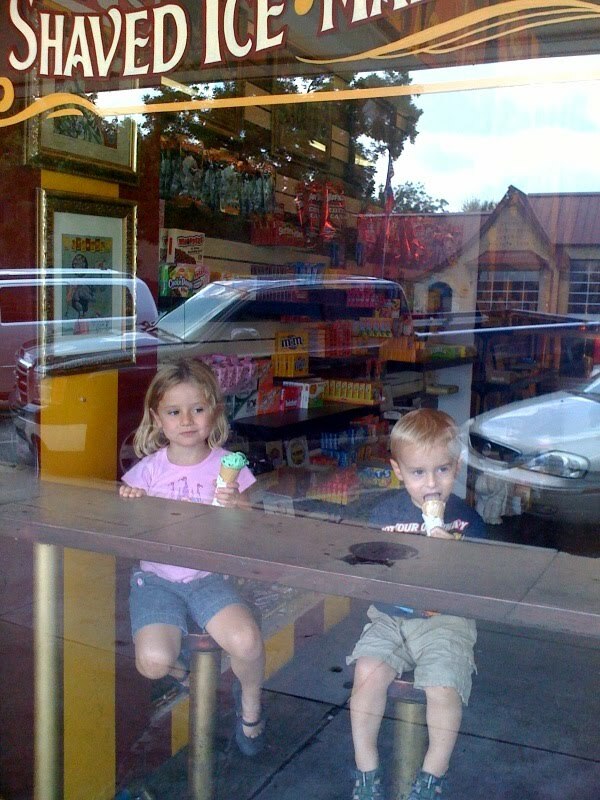 Emmylou and Miller love Big Top Candy Shop! Sometimes we take them in there if we go down to Guero's for lunch. 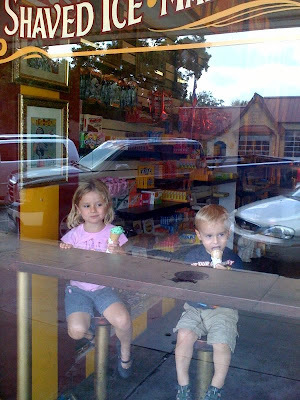 This day, surprisingly, they picked ice cream over candy. Crazy kids. Can I freeze you? Right now? You are the sweetest thing I could ever imagine. You love your "Big Book of Trains" and can tell me every color of every train in there. You have a really big crush on Jessie from Toy Story. You want to be Buzz Lightyear for Halloween but also every day up til then and after. You just learned this past week to say the word "Buzz" instead of calling him "Bee" like you did for months. You also just learned how to call your sister "EmmyLOU" instead of just "Emmy." You are starting to notice letters and think every letter is "I" or "B" or "O." (You point at the HEB sign and say "I! O!") You love brushing your teeth and using your Sponge Bob toothpaste. You are (drum roll, please!) finally a better eater. After 24 months of eating habits ranging from ho-hum to atrocious, we had a green bean showdown last week that seems to have been the ultimate cure-all. I wouldn't let you out of your chair until you took a bite of a green bean and although it took almost an entire hour and a few tears, you finally took one bite, declared it "nummies!" and then proceeded to eat five more whole green beans. The next day was the hot dog showdown (yes, that's how desperate I am- forcing you to eat hot dogs) which took about thirty minutes. Again, "nummies!" and "more hot dog!" We eventually got through pizza and rotisserie chicken and yesterday I noticed when I asked you to take a bite of something you took about one second to think about it and then put it straight in your mouth. I'm not sure I have ever felt as victorious as I did those nights! Thanks for making me feel like Super Mom, I needed it. This last month has been a big one for you. You are talking so, so much about anything and everything and trying to do everything your sister does. You even peed in the potty yesterday for the first time! You love school. When I turn into the parking lot in the mornings you shout "yay!" which is great on the mornings you get to stay. The trouble is on the two days a week that Emmylou goes to school and you don't. You get so upset when it's not your turn! I was so proud of you those first couple of days. You were so happy to go and start playing! You love your teacher, Ms. Marci, and you love having Tate in your room with you. I keep asking you if you're a baby and you say "no, big boy!" I try to explain to you that you can be both, but mostly I just have a hard time not gobbling you up. You fill my heart with joy. I love you so much, Miller! When we left Dollywood we drove to my Aunt Jane's house a couple hours away for the last stop on our Tennessee trip. She lives in a charming resort community made up of eleven lakes and five golf courses. Being that it's a couple thousand feet above sea level and that she lives right on the water, the weather always seems to be fantastic. Jane has a great screen porch that gets a lot of use. Emmylou took advantage of it both afternoons we were there during naptime. Someone else found a new place to nap... This is Jane's dog, Daisy, who I refer to as The Sweetest Dog in the Entire World. Emmylou loved that she found her little bed to sleep in! More from our visit with Jane to come! After our brief trip through the Smoky Mountains sans carseats (I probably should've mentioned in my last post that we topped out around 10 MPH on the driving tour loop, just in case you have plans to report me to CPS), we headed to Pigeon Forge, TN. 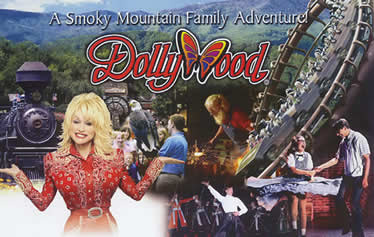 Dollywood is located about 7 minutes from Pigeon Forge, which turned out to be a lot like a low-rent Vegas for kids. The main street seemed to go on for miles with dozens of go-cart places sandwiched between Medieval Times, laser tag businesses and bungee trampoline set-ups. Also, there were an inordinate number of pancake houses and many Family Inns of America, a chain I'd never heard of before. Anyway, we did not stay in one of the there-must-have-been-twenty Family Inns of America and stayed, instead, in what was probably the nicest hotel in Pigeon Forge (thanks for making those plans, Grammie!). Once we arrived, Grammie, Emmylou and Miller went swimming while I ordered pizza for dinner and went in search of some much-needed wine, which, unfortunately was unsuccessful, since as it turns out, most of Tennessee is composed of dry counties. What?! Surely Dolly likes her cocktail every once in a while, right? We managed. One of the first stops in the park? A tour of Dolly's "Home on Wheels:"
At Dollywood you can also buy a new wardrobe for yourself at Dolly's Closet. Slogan: Her Style. Your Size. Thank goodness. The other thing we made a beeline for on our way in was a ride on the coal-burning steam train. I thought Miller would burst with excitement over getting to ride it, but in reality he just looked kind of nervous and worried the whole time. The train whistle was really loud so I guess it was kind of understandable. He did ask to go on it again a couple hours later so it must not have been too bad. After the train we hit most of the rides for the kids, and they loved them. She's the "Chicken Lady" who walks around the restaurant with a ukulele making up songs about whatever's going on at that exact moment. Since Miller fell asleep for about an hour in there, she came over to our table a few times and had us cracking up. I really can't explain it, but if you find yourself at Dollywood, please go see her. You won't be disappointed. 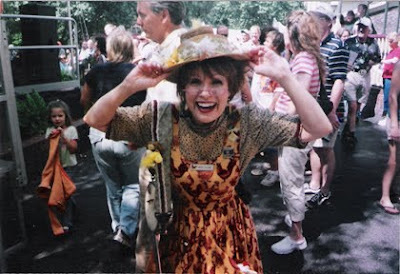 Once Miller woke up we headed over to one of the many shows Dollywood puts on which made zero sense (like most amusement park productions) and had me distracted the entire time feeling sorry for the actors and wondering whether they thought they'd "made it" by being a Dollywood performer. Does anyone else do that? Emmylou napped during the entire thing. Then we bought Miller a drink that came in a train shaped bottle. If you look closely you can see that he's wearing his Willie Nelson shirt. It just seemed appropriate for the occasion. 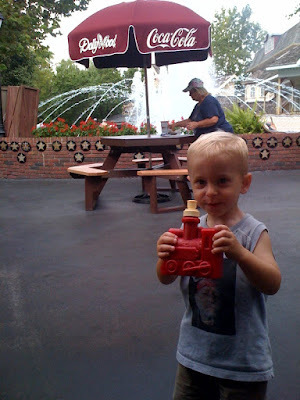 After a visit to one of the many candy stores in the park, our last stop was in Jukebox Junction where we found these great vintage cars the kids loved driving. As was true for the rest of the park, there were no crowds and no lines so we got to ride them as much as we wanted. On the way out Emmylou and Miller chose to buy their dad a shot glass with Dolly's picture on it as a souvenir. It even said "I (heart) Dad" on it. Kind of reminded me of the last time Emmylou wanted to buy a shot glass. He loved it! Dollywood was so much fun! Thanks for a great day, Dolly! We love you! I'd like to formally apologize to everyone who was in the car with me for singing that song every half hour on our way from Nashville to the Great Smoky Mountain National Park. Emmylou and Miller thought the best part of the park was riding through Cade's Cove without wearing their seatbelts and sticking their bodies as far as possible out the windows. It was so beautiful, we'll have to go back when we have more than just a couple of hours! Where's the best place to take a 4-year old and almost 2-year old who most often resemble wild animals? Why, a giant, breakable, outdoor glass art installation, of course! Honestly, it might be a miracle that we didn't have to contact our insurance agent during our visit to see Chihuly at Cheekwood. "Hmmm... could that be giant floating candy?" It was a little exhausting corralling the kids but well worth the effort. The grounds were stunning and the art was perfect to see at twilight. :) Thanks to Cathy and Ann for taking us!